The last eighteen months has been a reckoning for powerful men in the business world and gaming has been no exception. The #MeToo Movement struck down one of the most recognizable names in the gaming industry when Steve Wynn stepped down from the company he founded, Wynn Resorts. These issues have continued to shine a spotlight on CEO pay, severance and golden parachutes. Four other CEOs in gaming are out or on the way out soon. Caesars recently announced that Mark Fissora is stepping down at the end of the year. All that said, it was a very solid year for casinos stocks, with many of the bigger companies outperforming the small ones. In our twelfth annual study of gaming industry pay, we evaluated the performance of 34 public gaming companies in determining whether a CEO deserved his or her pay. The AETHOS pay-for-performance model compares significant financial metrics such as company size (market cap), stock appreciation (rise in stock price over 3 years), EBITDA growth (over 3 years), and total direct compensation (combination of salary, bonus, LTIP & other). Our findings are illustrated below. It comes as no surprise that the highest paid CEOs in the gaming industry work for the largest companies. Steve Wynn topped the list again as the highest paid CEO in gaming at $34.5M in total compensation. Sheldon Adelson at Las Vegas Sands came in second at $26M in total compensation. Ken Alexander at GVC and Fissora both were $20+ million-dollar men. In total, 26 of the 34 CEOs made more than $1M in total compensation. Up two from last year, with two less companies in the study. The average CEO paycheck went up substantially to $7.2M. That is nearly $2M more than last year’s study. CEOs are clearly getting larger equity packages in a consolidating marketplace. For a second year in a row, the best CEO on a pay-for-performance basis was Dan Lee, CEO at Full House. Other top performers included Gary Carano at Eldorado Resorts and Tim Wilmott at Penn National. In Lee’s case, our analysis suggests he should have been paid double what he was paid, and Wilmott could have earned nearly $4M without jeopardizing his performance. 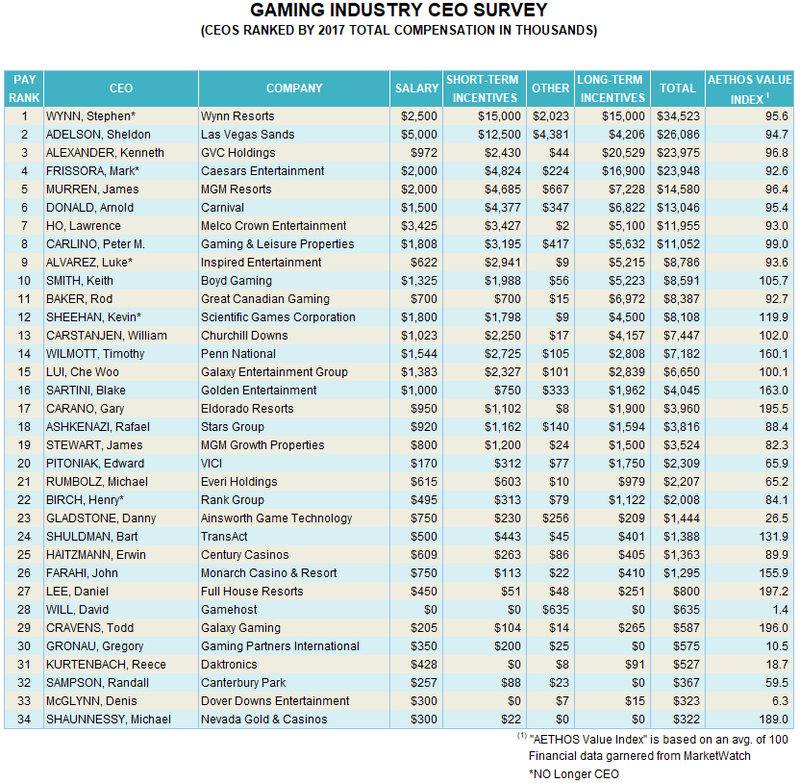 Thirteen CEOs in the gaming industry received a base salary of $1M or more. Sheldon Adelson and Lawrence Ho had the largest salaries, at $5M and $3.5M respectively. The average salary of the group came in at just over $1.1M. As most bonus programs are tied to base pay, it comes as no surprise that many of the most highly paid CEOs also received the largest bonuses, with Wynn leading the group with a bonus of $15M. The next largest bonus was Adelson at $12.5M. The average CEO bonus for the group was $1.1M, rising another $600K from last year. Only four gaming CEOs received no bonus, and all had weak financial performance and low performance indices. The largest component of CEO compensation was long-term incentive plans (LTIPs). A sign that pay-for-performance continues to be a major focus for public boards. The average LTIP value was $3.7M, more than double from the previous year. Ken Alexander topped the list with his nearly $21M stock grant, followed by Fissora at $17M. Twenty-one CEOs received an equity grant worth over $1M, while only four received nothing at all. It appears that gaming boards are getting more in line with standard pay practices in the Fortune 1000. With nearly 30 years of experience in hospitality, Keith is a career industry executive. Having graduated from the Cornell University Hotel School, he went on to work at Waldorf=Astoria Hotel before embarking upon a career in hospitality executive search. He was the CEO & founder of HVS Executive Search before joining AETHOS Consulting Group. A frequent lecturer on industry-related issues, Keith has written more than 200 articles on the topics of executive selection, pay-for-performance, corporate governance and executive leadership. His book, The Loneliness of Leadership was published in 2016 and is available on LuLu.com. Keith also produced the Cannes Film Festival award-winning short film, the Power of Advice.